Maritime Travel is first and foremost Canadian! 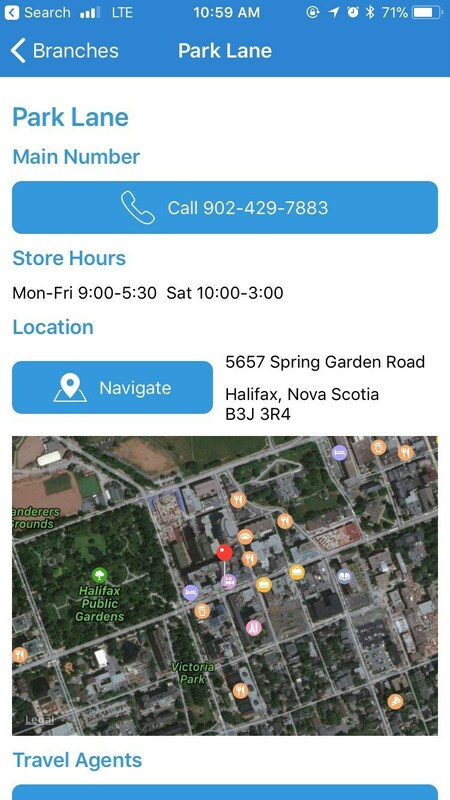 We have grown steadily through both acquisition and expansion since opening the first storefront in 1949 in Halifax, Nova Scotia. Currently Maritime Travel has 117 locations across Canada trading under Maritime Travel and LeGrow’s Travel (Newfoundland and Labrador) and is the largest privately owned Canadian Travel Company offering a full service, high-touch experience with a focus on both Business Travel and Leisure travel and related offerings. We generate over $320 million in annual sales and employ over 500 people across the country. Our client base includes multiple entertainment, oil and gas, industrial, educational institutions and professional firms across Canada. We take pride in our unique ‘boutique’ approach to service and in having one of the most experienced teams in the country with our counsellors having, on average, 15+ years of industry experience. We provide expertise to over 1,000 corporations across Canada and service the needs of their US divisions as well. Our private Canadian ownership structure leads to a flat hierarchy which combined with the vast scope, variety of clients and size of our national business, allows us to move quickly in seizing opportunities that bring value to our clients with urgency and efficiency. The most recent examples of our proactive culture is the establishment of Air Content Direct Connect that includes both Air Canada and West Jet web content. In fact, Maritime leads the Canadian market with the integration of both operating systems and continues to introduce enhancements to both systems, delivering enhanced value and access to our client base in Canada. We have no distractions or divided loyalties outside our country by US or International suppliers. Our focus is the Canadian marketplace. • A strict adherence to a robust travel policy which we will help you draft and customize to your specific needs and culture. • Assurance that your travellers receive options prior to ticketing, so all cost comparisons are in front of them. • Access to lower fares through our integrated fare search tools which search various airline and online sites to ensure that options are not missed when a traveller is booking their flights. • Maritime Travel, as the largest independent retailer in Canada and through our global partnership with Radius, has significant negotiating power which we will pass on to your travellers. • Savings in international airfare through our own consolidator division, preferred rates for hotels and car rentals (including Expedia rates)throughout the globe, plus the ability to track your spend and help you negotiate your own programs, will help drive savings to your bottom line. • Access to global fares: availability and discounts through our Radius partner network. • Our duty of care management reporting which allows us to track where your travellers are at any time. • Another service Maritime Travel provides is our E-travel alerts which are issued to a traveller if there is a red or orange alert in the international destination that the traveller is visiting. • Maritime Travel provides its travellers access to its 24-hours-a-day, 7-days-a-week, 365-days-a-year, “After Hours Business Travel Assistance” line available throughout Canada and around the world. All after-hours service is provided using Maritime Travel’s own employees and is now available via email as well as via phone. • Maritime Travel will help you audit and measure your spend through the usage of our unique technologies including our Unused Ticket Tracker report which reports on your existing traveller credits, so money is not left on the table; our Client Account Statement which will help you reconcile your credit card statements; monthly Management Reporting that looks at your overall spend and trends, as well as provides benchmarking and analysis, so you can see how you are performing compared to your peers; plus the skills of our experienced counsellor teams with an average of 15+ years in the industry. 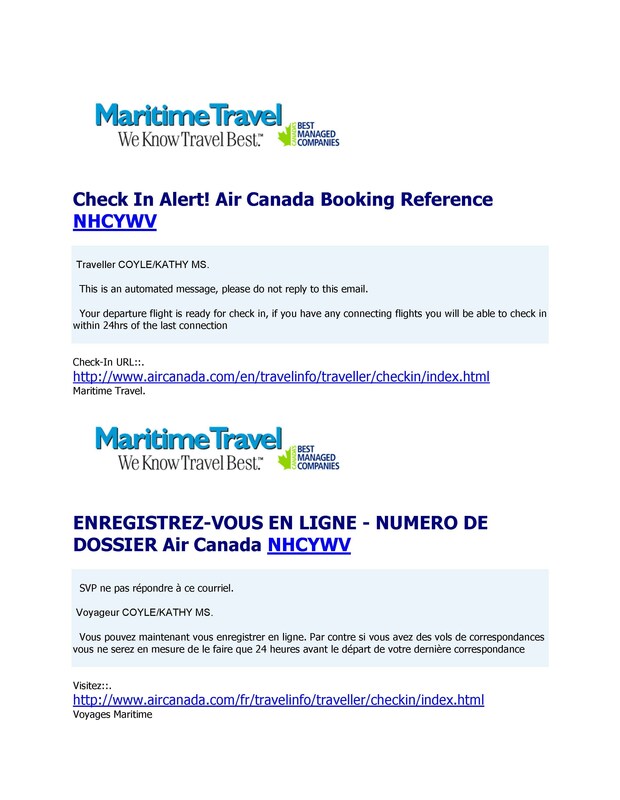 • Maritime Travel has recently integrated an advanced check-in reminder which is sent 24 hours in advance to the traveller reminding them that they can now check-in for their flight. • The Maritime Travel Mobile App: Quick access to our travel services while on the go! As one of Canada’s “50 Best Managed Companies” every year since 1998 (including induction into the “Platinum Club” since 2004), and as one of Canada’s Best Employers, we are a proven entity in delivering the strategic program that you can rely on. 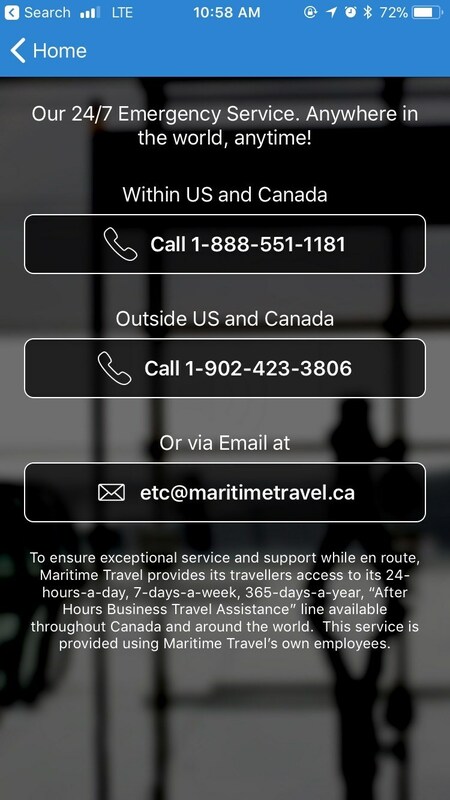 Maritime Travel utilizes an alert service (E-Travel alerts) for clients which sends an e-alert to a traveller with an itinerary outside of North America, alerting them to any” crisis or warning” events that could affect their destination. Maritime Travel can also provide you with our Crisis Management reporting through our online reporting tool?. Crisis Management Reporting allows you to quickly see who is, was, or will be traveling to any destination. Maritime Travel offers access to our unique Client Account Statement which provides a historic and real-time record of all air travel. The Client Account Statement is a summary of all transactions that will be essential for the reconciliation of your credit card statements and travel charges. Maritime Travel produces post trip travel management reports, monthly, for most of our larger volume clients; however, these reports can also be done quarterly or annually, depending on our client’s request. We will review our management reports with you on a regular basis and, if necessary, further tailor them to your reporting needs. Maritime Travel will use the information provided by these management reports to assist you in negotiating improved rates with those suppliers that your travellers use most frequently. • Access to all the most important information in a single app. No need to track down and go to multiple websites while you are on the go. • Emergency Travel Service - all channels of contacting our Emergency Travel Service are available within the app itself, including phone numbers based on location and Email. So when you need to contact someone right away, you have one spot to go to. •	Save your upcoming Maritime Travel trips within our app and view while you're on the go (*viewing trip information requires internet connection). See your flight, hotel, and car rental information. You'll get to see your flight times, hotel details and confirmation number, car pick up and drop off locations and much more. You can also add your trip itinerary to your calendar on your device. Powered by Travelport ViewTrip. • Access to our Concur Online Booking Tool, along with our Concur Online Support service. All channels of contact available within the app. 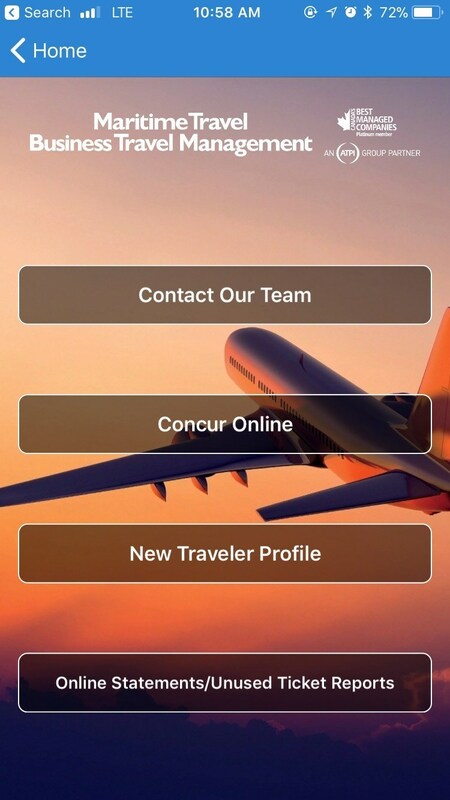 • Access to our Business Travel Management team via Email or phone, right in the app. • Access to our Destination Services booking tool, so you can book extra items like meals, tours, events while in specific cities. The Concur online booking tool, Maritime Travel’s self-service reservation tool, allows travellers or travel arrangers to book policy-compliant travel online at a much lower fee. It automatically applies corporate policies and your negotiated contracts to ensure travellers and arrangers make air, car, and hotel reservations in-policy and on budget, and allows Maritime Travel to capture the booking information for analysis and management reporting purposes. Our “Unused Ticket Tracker” tracks both Web and GDS Bookings and bookings. Both the Travel Arranger and/or the traveller are notified of the expiry via an electronic alert every quarter, as well as one month prior to expiry. Maritime Travel has an excellent relationship with all major airlines in Canada - Air Canada, WestJet, Porter Airlines, Provincial and Canada North, as well as many regional carriers. Maritime Travel also has existing agreements with the larger US and international carriers. Maritime Travel, through its corporate and leisure buying power, has negotiated preferred hotel and car rental rates with the major global suppliers: Budget, Avis, National, Alamo, and Thrifty.